Oh, its been a week since I posted. Lets not talk about work but instead, lets talk about some chocolate sensation for your mouth. Since St. Pats is just around the corner, I know you need a little Irish Magic. And if you are going to make delicious chocolate cupcakes, you might as well make the BEST delicious chocolate cupcakes. And if you need a little treat to take to the St. Patty's Day party, let these be your honored guest. A friend recently asked how I learned to cook & bake. Practice. I have come a long way since I burned french toast so badly there remained a charred outline of bread in the pan. Or when I served a boy dinner comprised of kool aid and popcorn ( I was young and I think in retrospect he was there for teenage make out party and NOT coq au vin). My very first "real" dinner was for a guy in grad school. I remember clearly ruminating over the recipe with my gal pals ShaNaNa and MarciaGarcia as we sipped cocktails one afternoon. Making dinner for someone seemed like such a big step. I made a cracked pepper linguine. And it was, in a word, inedible. I didnt know you do NOT substitute one tablespoon of cracked pepper for ground pepper. He was a good sport and tried not to gag when he worked over that first bite. At least I had bread to serve, until I caught it on fire putting it too close to the broiler. Lesson learned, and how. I didnt get serious about cooking until years later. And now, I love it, am much better, and more creative. All you need is a little time, great recipes or creativity, and the willingness to be able to dump something in the garbage if it just doesn't work out. Now, lets get back to the chocolatey goodness. From my kitchen to yours, enjoy every bite. In a large mixing bowl, whisk together the cocoa, sugar, flour, baking soda, and salt. In another medium mixing bowl, combine the stout, melted butter, and vanilla. Beat in eggs, 1 at time. Mix in sour cream until thoroughly combined and smooth. Gradually mix the dry ingredients into the wet mixture. Lightly grease or use paper liners in 24 muffin tins. Divide the batter equally between muffin tins, filling each 3/4 full. Bake for about 12 minutes and then rotate the pans. Bake another 12 to 13 minutes until risen, nicely domed, and set in the middle but still soft and tender. Cool before turning out. In a medium bowl with a hand mixer, beat the cream cheese on medium speed until light and fluffy. Gradually beat in the heavy cream. On low speed, slowly mix in the confectioners' sugar until incorporated and smooth. Cover with plastic wrap and refrigerate until ready to use. Icing can be made several hours ahead and kept covered and chilled. Top each cupcake with a heap of frosting and dust with cocoa. You can also use non-flavored green food coloring to make the icing green. Now, go pinch someone. While I earnestly ply you with all kinds of delicious and decadent baked goods, I am an avid healthy eater the majority of the time. My go to salad is one of the easiest (and best) salads you can make. I eat this or some variation at least 3x a week. I also make all my own vinaigrettes which are also super easy and super healthy. From my kitchen to yours, enjoy every bite. Lately I have been using the Blue Diamond spicy almonds, placed first in a sandwich bag and crushed with a back of a spoon. This salad combines a little creamy from the goat cheese, with a sweet from the cranberries and a popping crunch from the nuts. 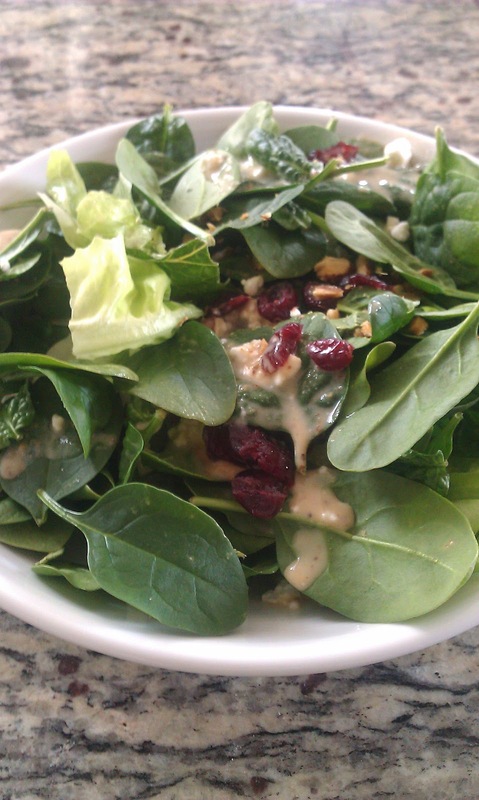 Add an easy vinaigrette and you have a great lunch. Place all ingredients in bowl and whisk. Added bonus: It takes less than 2 minutes to make this dressing. You can easily use different types of mustard, flavored vinegars like red wine, white wine, balsamic, and I have also used lemon juice, lime juice, orange juice, mango juice (in small quantities) to flavor. When I want a little olive oil, I use an amazing blood orange or raspberry olive oil for another layer of flavor. And when I want to add a kick, I use the adobo sauce in the can of chipotle peppers. Enjoy and Happy Saturday. Also, because I just love to pimp Costco, you can buy organic baby spinach and butter lettuce in a completely manageable size for about $5 per carton. When you board the plane and there is no space for your bag in the overhead compartment, you should definitely just stand there and spend 10 minutes trying to jam it in the overhead anyway with no regard for all the other bags already in there. Nope, shove away! It is awesome for the people behind you trying to board and it is awesome to watch. Kind of like watching someone shove an elephant into a dixie cup. Doesnt work well, does it? It is unfortunate I am not friendly with the guy in 20D on my flight from NYC last night so he won't know to read my blog today and discover this important message. You on the other hand, have a fabulous weekend.